Author(s): James C. Nelson, University of California, Department of Psychiatry, 401 Parnassus Ave, 94143, San Francisco, CA, USA. Peter Zhang, Aleksandar Skuban, Mary Hobart, Catherine Weiss, Emmanuelle Weiller, Michael E. Thase. Background: Many patients with major depressive disorder (MDD) do not respond adequately to first-line antidepressant treatment (ADT). Adjunctive treatment with second-generation antipsychotics has demonstrated efficacy for patients with MDD, but is limited by tolerability and safety issues. The recently introduced serotonin-dopamine activity modulator, brexpiprazole, has demonstrated efficacy as an adjunctive treatment for MDD. 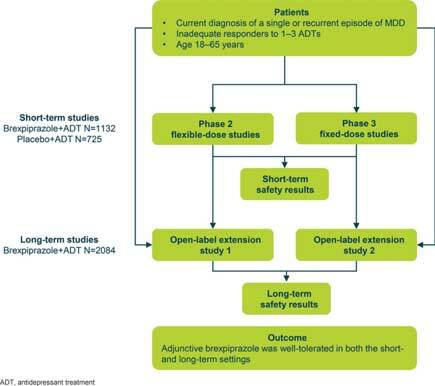 Objective/Method: We report tolerability and safety results for adjunctive brexpiprazole from four 6-week short-term (ST; pooled phase 2 and 3, placebo-controlled) and two 52-week long-term (LT; pooled, openlabel) studies. Results: Approximately 90% of patients completed the ST studies, and 48.8% of patients completed the LT studies. In the ST studies, 2.9% of patients discontinued because of an adverse event (AE); in the LT studies, 14.1% of patients discontinued because of an AE. In the ST and LT studies, the most frequently reported treatment-emergent AEs (TEAEs) were akathisia (8.6% and 10.0%, respectively) and weight gain (7.3% and 25.5%, respectively). Rates of sedation and somnolence were low (ST and LT: sedation, 0.8% and 3.7%, respectively; somnolence, 3.4% and 9.4%, respectively). In the ST and LT studies, brexpiprazole was associated with small changes in metabolic parameters and moderate weight increase. Conclusions: Collectively, these data suggest brexpiprazole is well tolerated as an adjunctive treatment for MDD. Keywords: Adjunctive therapy, antipsychotics, brexpiprazole, major depressive disorder, safety, clinical trials. Affiliation:University of California, Department of Psychiatry, 401 Parnassus Ave, 94143, San Francisco, CA, USA. Keywords:Adjunctive therapy, antipsychotics, brexpiprazole, major depressive disorder, safety, clinical trials. Abstract:Background: Many patients with major depressive disorder (MDD) do not respond adequately to first-line antidepressant treatment (ADT). Adjunctive treatment with second-generation antipsychotics has demonstrated efficacy for patients with MDD, but is limited by tolerability and safety issues. The recently introduced serotonin-dopamine activity modulator, brexpiprazole, has demonstrated efficacy as an adjunctive treatment for MDD.